While the biggest theological issue we Christians may encounter today is whether it’s more righteous to sing worship songs from the hymnal or from words flashed on a large screen at the front of the sanctuary, Bonhoeffer, himself a patriotic German and Christian, had to deal with Nazi threats and intimidation. And, the theological issue that Bonhoeffer grappled with as he witnessed the annihilation of Jews and the persecution of Christians under the Nazi regime was this: Can evil become so evil that the good must commit an act of evil to eradicate it? As the book ended with Bonhoeffer’s death at the hands of the Nazis, it left me with some unresolved theological issues. Why did Bonhoeffer have to die so young? Wouldn’t he have been more useful to God alive than dead? Furthermore, is it possible that the evil human beings commit against one another is sometimes so onerous that it requires the blood sacrifice of other human beings to mitigate it? “For the life of the body is in its blood. I have given you the blood on the altar to purify you, making you right with the Lord. It is the blood, given in exchange for a life, that makes purification possible” (Leviticus 17:11, NLT). Of course, we know that blood sacrifice is the reason that Christ came into this world. The punitive damage brought upon the earth and the human race from the human heart led astray by evil–what we call original sin–could only be assuaged by One greater than human beings, that is, God Himself in Christ. But, does the magnitude of evil in this world sometimes rise to the level that only blood sacrifice can mollify its proliferation, like a vaccine restraining a potential epidemic? When God’s law is immeasurably perverted to the extent that innocent blood is shed, does it require an in-kind sacrifice of goodness to keep evil somewhat in check? The same principle of blood sacrifice with which Christ broke the power of sin and death seems to be applicable to Christ’s followers in the face of extreme evil. Otherwise, why were all the apostles tortured and executed? It seems that is the case with the life (and death) of Dietrich Bonhoeffer. I suppose my ponderings seem more like a book review and that the theological questions I have raised are far beyond the scope of this meditation (or this blog) to resolve. So, let me pose my Biblically-questionable speculation and bring an end to all this musing. Great acts of evil can only be mitigated by great apportionments of grace. When the magnitude of the evil that humanity brings on itself becomes so considerable, it seems that it requires blood sacrifice to counterbalance it. If there is no one willing to die for good, then evil, particularly profound evil, will perpetuate itself and attempt to seize control over all that is good. Ostensibly, great evil can only be ameliorated by the actions of people of integrity who stand on principle and are willing to sacrifice everything, even their own lives, for what is true, right and good. Whether or not one should perform an act of evil to fight against evil, only God can judge. 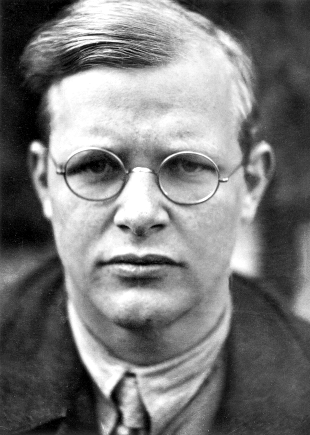 As for me, I admire and esteem Dietrich Bonhoeffer for his Christian integrity. He did not compromise with evil! This entry was posted in atonement, discipleship, integrity, sacrifice and tagged atonement, discipleship, integrity, sacrifice. Bookmark the permalink. Thank you for driving me to the WORD and my dictionary. Thanks, Steve. I’ve had a biography of Dietrich Bonhoeffer for years and love it. However there is a certain level of conviction that comes with reading it. Am I taking a strong enough stand against the evil in the world I live in? Same here, have to wonder what kind of Christian I would be in a world hostile to Christians. Thanks for reading, Gene.